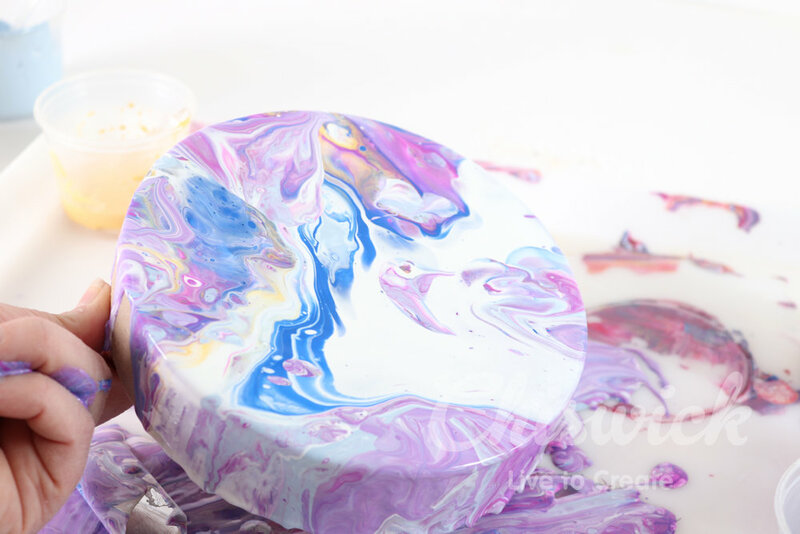 Paint Pouring Art using POP Paint. 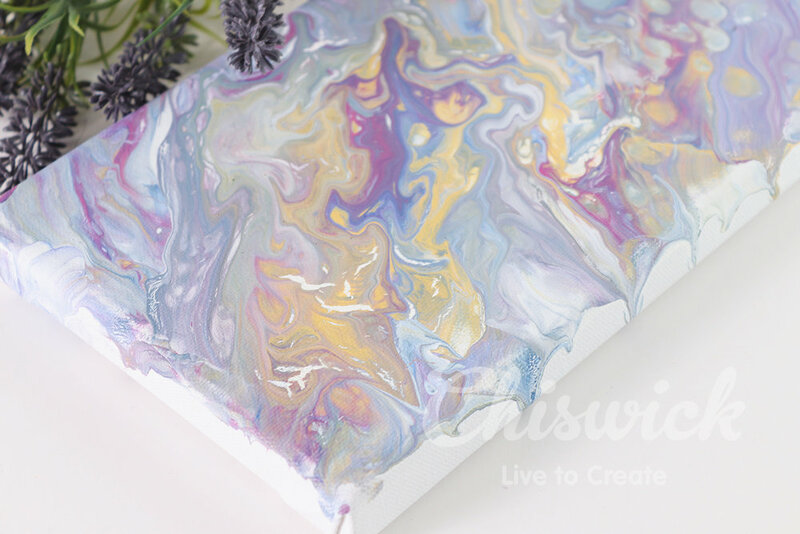 I used some left-over paint on a canvas and then swiped it using a large palette – something a little different. What I liked about the canvas was the texture and the finish wasn’t bad at all once it was dry. 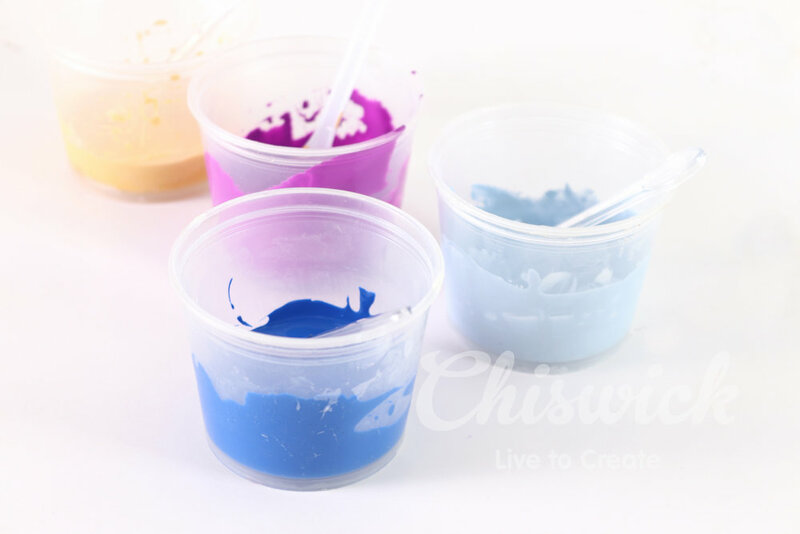 step 1 – choose at least 3-5 colours of paint you want to work with. My colours included Sky, Provence, Buttery and Haze. 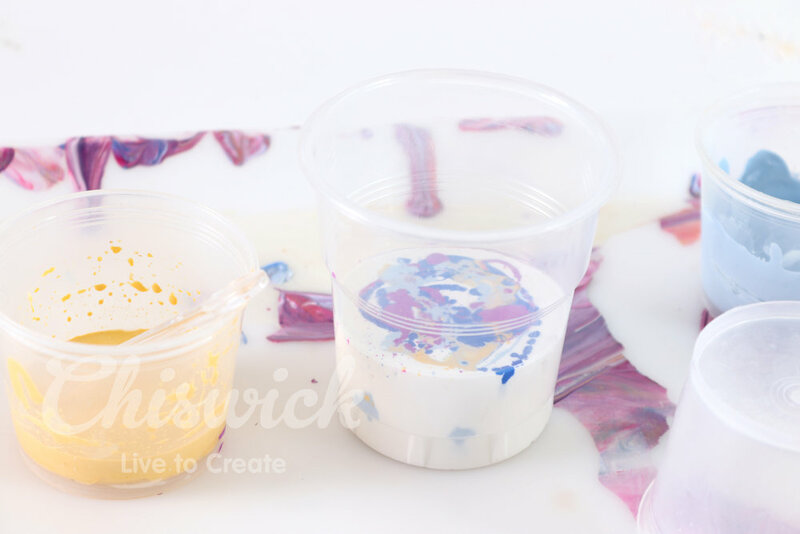 step 2 – Create the mixture to make the paint more liquidy to pour. 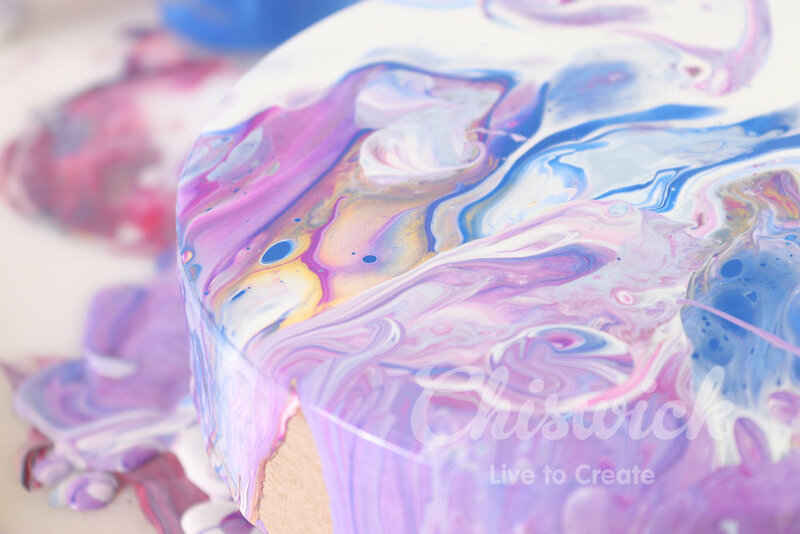 Mix 2 parts of paint, 2 parts of pouring medium, 10ml of water. TIP: Because POP Paint is so thick I added a bit more water to get the right consistency. 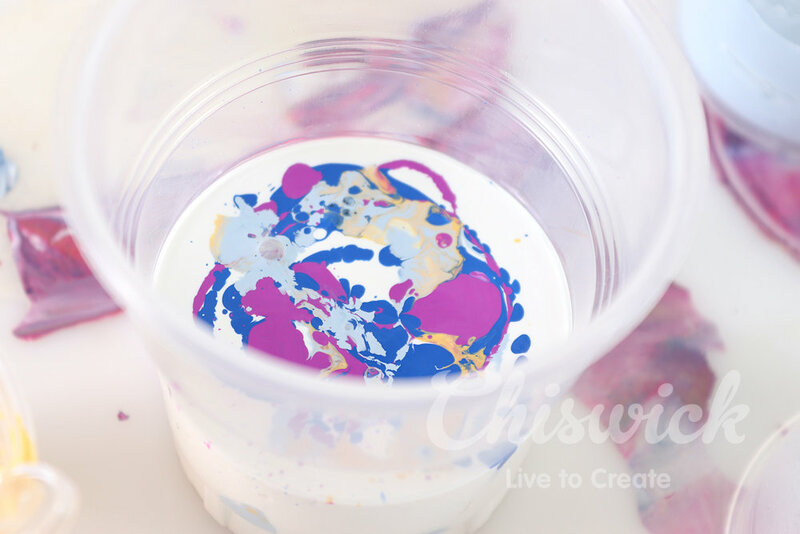 step 3 – In a large cup add about 2cm of white paint mixed with pouring medium in the bottom of the cut. Then add half of each of your colours, one at a time, pouring the paint into the white from high above. Add some more white, and then add the remainder of your colours. 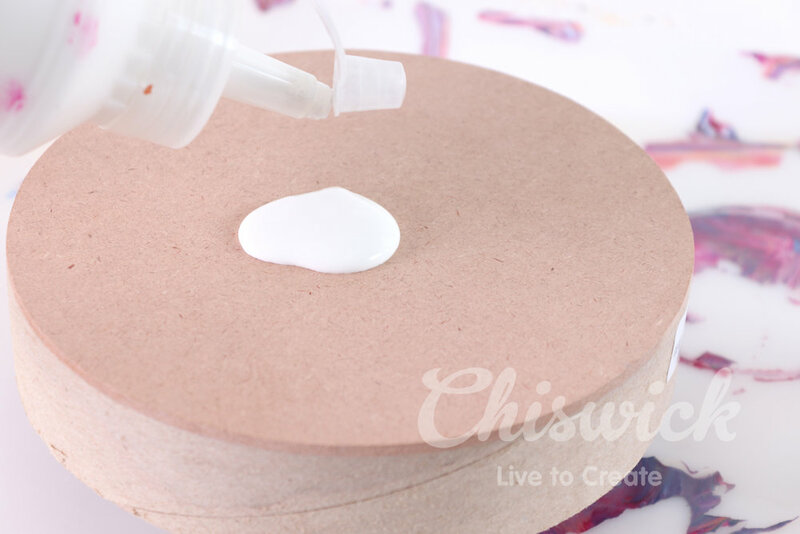 step 4 – Add more white onto your canvas. The same mixture with the pouring medium and white paint. TIP: you can choose to prime your canvas before – I just left mine natural. 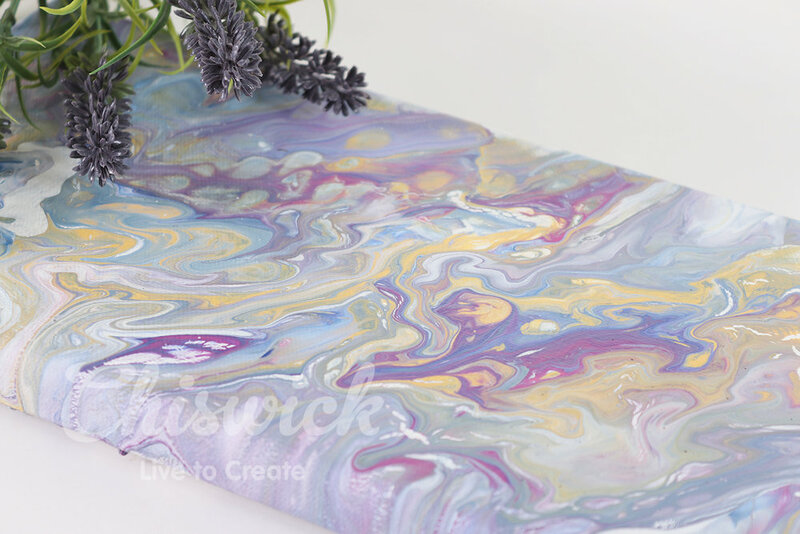 These wooden canvassses are great for pouring paint. 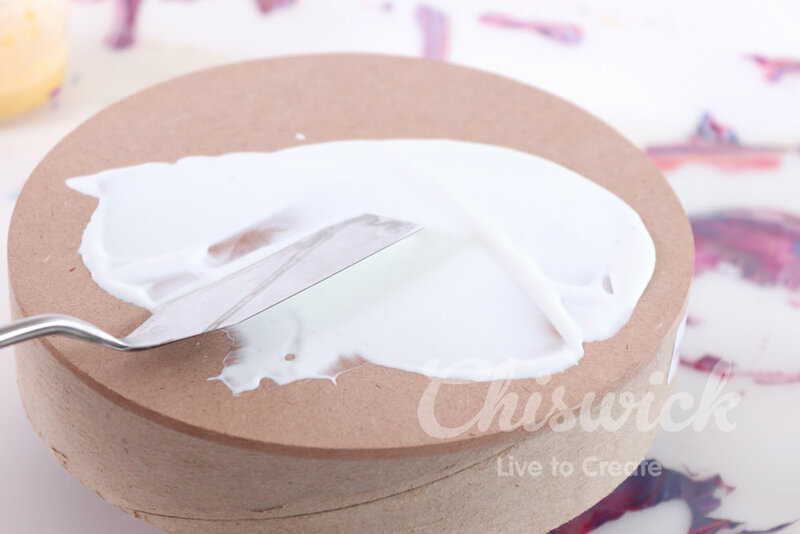 step 5 – Use a palette knife and spread out the paint to an even layer. step 6 – Flip the canvas over onto the cup. Hold the canvas tightly and the cup, and then flip it over so that the cup sits onto the canvas. 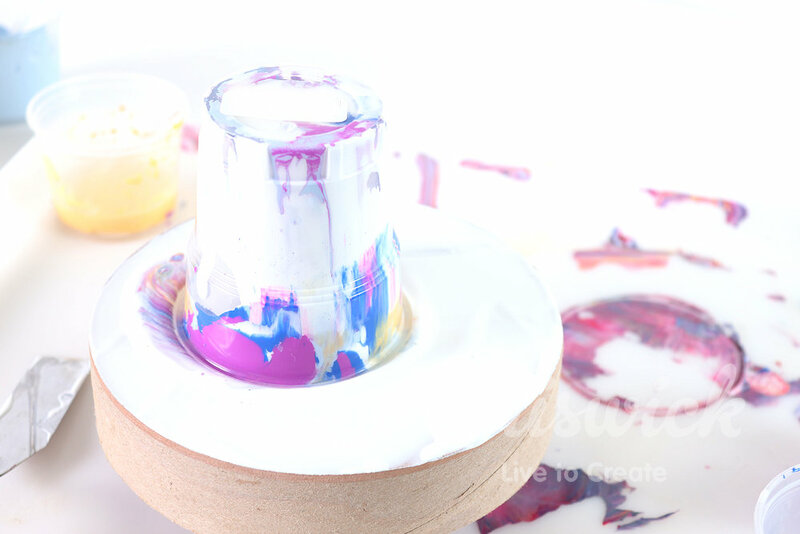 step 7 – Carefully lift the cup to break the air seal and let the paint start flowing. Drag the cup into the opposite direction and tap off any paint left in the cup on an open section of the canvas. step 8 – Tilt the paint in all directions to cover the entire canvas surface. Be careful not to tilt too much in one direction, and then always tilt it back into the original direction. This will prevent you disturbing the original pattern and poured effect too much. 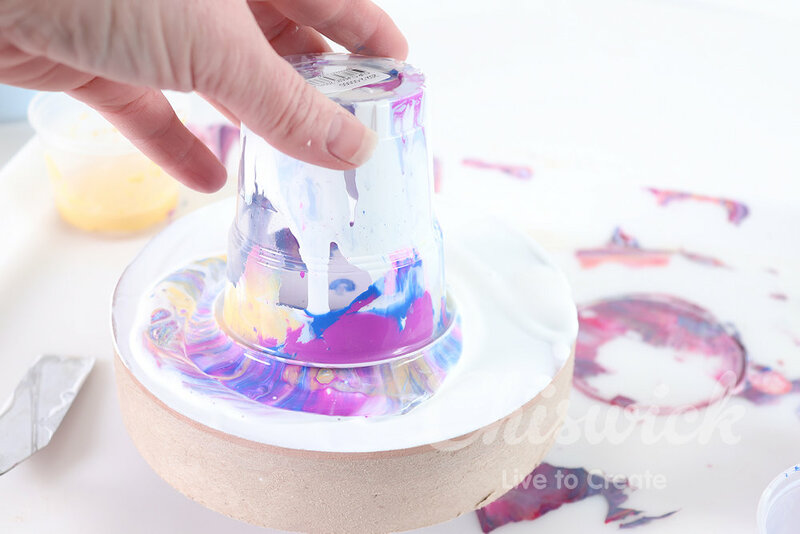 step 9 – Leave the canvas on a cup on a tray for excess paint drips. 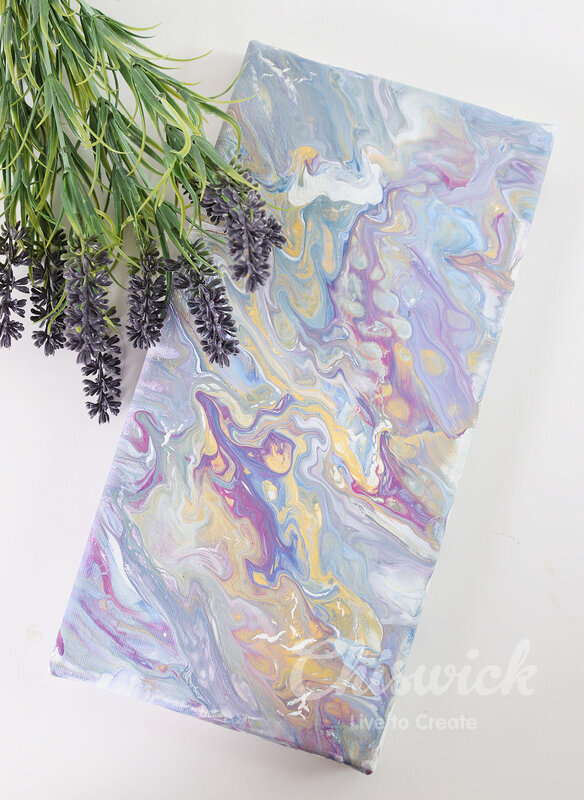 You can even scoop up some of the paint drips using your palette knife and let that drip onto the sides of your canvas. Once you are happy with the look leave the paint to dry at least 24 hours minimum. For this canvas I am going to add a resin layer that will finish it off beautifully. The wet paint will always be shiny, and once dry it becomes matt. A clear resin layer will give the paint a beautiful shiny look and finish. 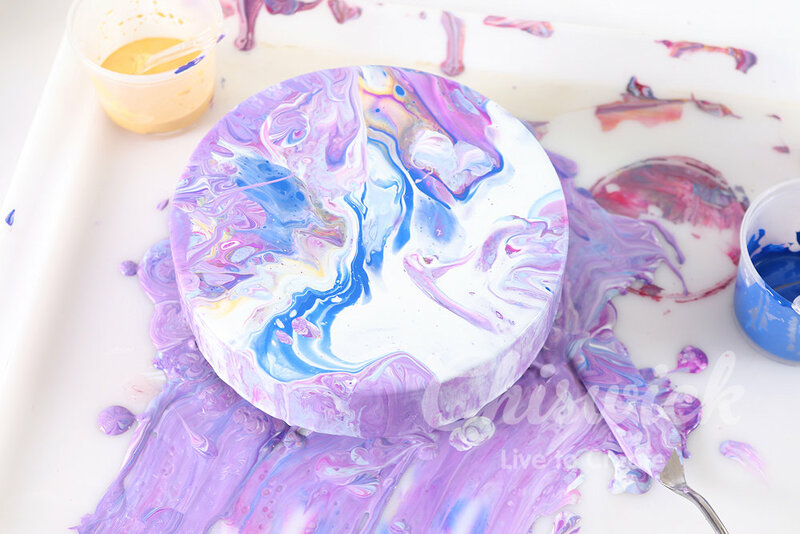 Go on give it a try – paint pouring is so much fun and addictive. 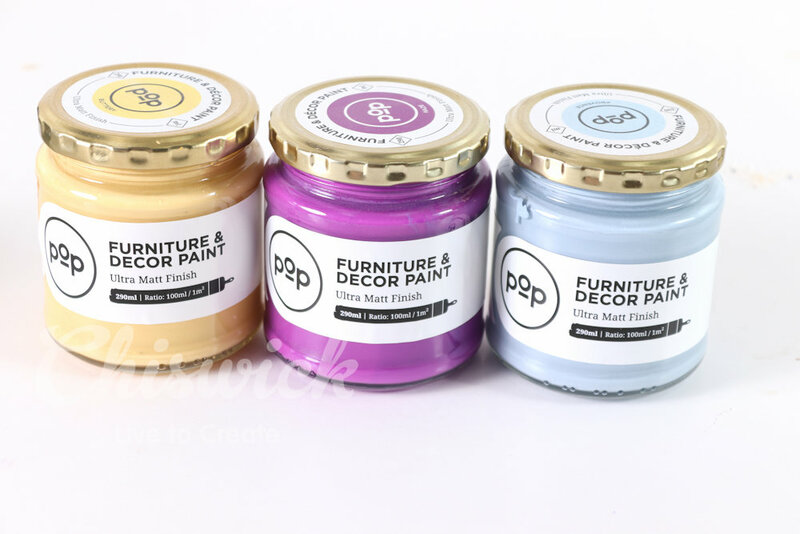 And now you can use your favourite POP Paint colours to create matching art for your home.